Argentina Set in the Andes near the border of Argentina and Chile, Cerro Aconcagua is the highest mountain in South America and the highest peak in the Southern Hemisphere. The peak has two distinct aspects: the northern side, which is gently angled to the summit, and a huge, steep and complex south face on which the hardest routes up the mountain are found. 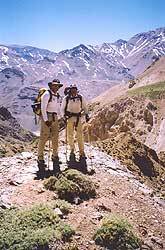 We'll climb the northern side of the mountain along the Vacas and Relinchos Valleys. This approach and the lack of crowds at the "normal" Plaza de Mulas base camp and on the mountain make this a much more enjoyable experience than doing the standard Normal Route. The climb does not require technical climbing ability, but it does require good fitness, a degree of mental toughness and the necessary skills to look after yourself in the mountain environment. After the flight to Mendoza, we'll spend a night in the city before driving into the mountains. From the hotel at Penitentes, we'll start our approach to the mountain taking a 3-day 'walk in' up the Vacas and Relinchos Valleys. This is a much nicer, less crowded way to approach the mountain than the usual Horcones valley 'walk in'. Utilizing the lightly used Plaza Argentina base camp (4200m) at the foot of Aconcagua's East Face, we'll ascend in short hops in order to acclimatize, following the Polish Glacier Route to its second camp before a rising traverse joins the Normal Route just below the Independencia Hut. Basically, 2-3 more camps are required to climb the mountain and typically we move our spare equipment and food to a higher camp, before returning to the lower camp to rest. We then move up to the higher camp and stay there. This steady upward progress should make it possible to reach our top camp and the summit without experiencing serious altitude problems. From the summit, we'll have a spectacular 360 view. To the west lies Chili and the Pacific Ocean; to the east, the plains of Argentina. We'll descend to Plaza de Mulas base camp, where the hot drinks and the great food awaiting are most welcome! The next day, we'll load the mules for the trek out via the Horcones Valley to the trailhead. In addition to summiting the highest peak in the Americas, you have now also completed a circumnavigation of this great mountain. We should arrive back in Mendoza late in the evening for a couple of days of 500 gram steaks, Malbecs and Cabernets and the culture of Argentina's exciting city life.